I was in our collaborator’s research area and discovered this little collection of empty champagne bottles – each signed by a graduate student on the day he or she had defended a Ph.D. dissertation or a Master’s thesis. Many bottles also sport a sentiment in addition to a signature and defense date. The sentiment sometimes deep and meaningful, sometimes simply joyful. My lab also holds this tradition. I found this interesting that the tradition exists in other research environments — this one chemistry, mine biology. Two news articles I read today told of several vials of Smallpox dating back to the 1950’s that were discovered in an unused National Institutes of Health storage room — in an unauthorized lab space. But you might wonder how could that happen? In the past couple of years, I’ve personally cleaned out several laboratories of researchers who have moved on or retired. I can tell you that a box of vials could easily find its way to the back of a cabinet or deep in the permafrost of an ultra-low freezer. Now when I cleaned out these labs, I didn’t find anything so dangerous as vials of freeze-dried highly restricted human pathogens. Thankfully! But what I did find was a combination of disgust and amazement. Rusted cans of disinfectant, plastic containers of formalin-fixed mouse bits, microscope specimens that might have dated back to the turn of the century, chemical bottles with peeling labels and rusted lids. Many years ago, when my department allowed researchers to scavenge equipment (perhaps a better term would be “upcycle”?) from a retired researcher’s lab, I found a long-dead octopus named Cornelius floating in a jar of murky formalin. He was circa 1980’s — not quite the 1950’s like the specimens found in the NIH lab. Had these things not been removed from the defunct labs, these lost bits of research history might have passed unwittingly to the next researcher to take possession of the lab space. A prime example of this can be found in a news story from three years ago. A researcher discovered a dusty old box containing experimental samples dating back to the 1950’s of his mentor who previously occupied the lab space. And the researcher found a wonderful new finding waiting to be discovered. 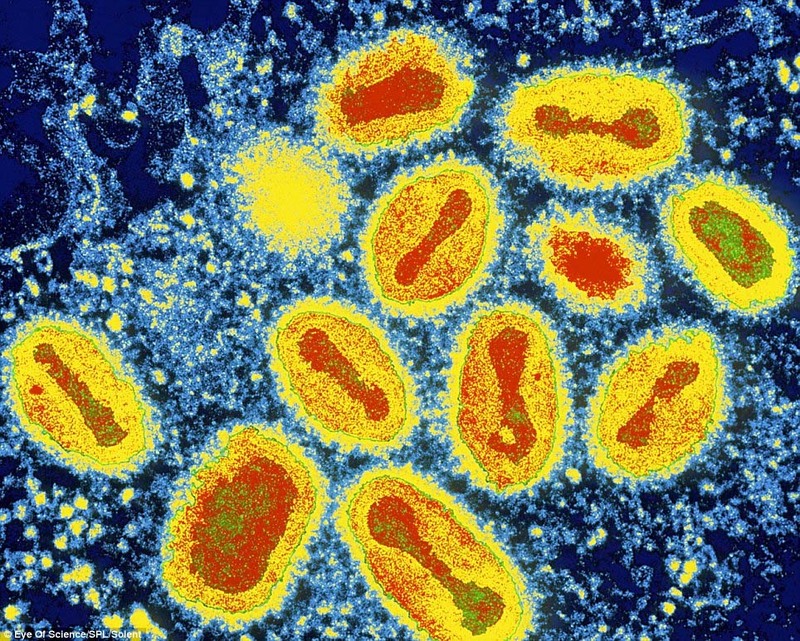 So, the discovery of long-forgotten vials of Smallpox in an unauthorized lab IS big news. If not, disturbing news. But how those vials from the 1950’s wound up in a rarely used cold storage room may not be as sinister as it might sound. Usually when we weigh out chemicals in the lab, we use a little brush to clean off the balance. But now that we work with nanoparticles, the brush is not the right tool for the job. Nanoparticles are tiny – in our case, really tiny particles, measuring one hundred nanometers or less in diameter. To put their size in perspective, they are roughly the same size range as many viruses, including the common cold virus. They can are much smaller than a bacteria (one hundred to a thousand times smaller). And, in terms of a typical human hair, you would have to line up a thousand or so nanoparticles (each one hundred nanometers in diameter) to span the width of a human hair. 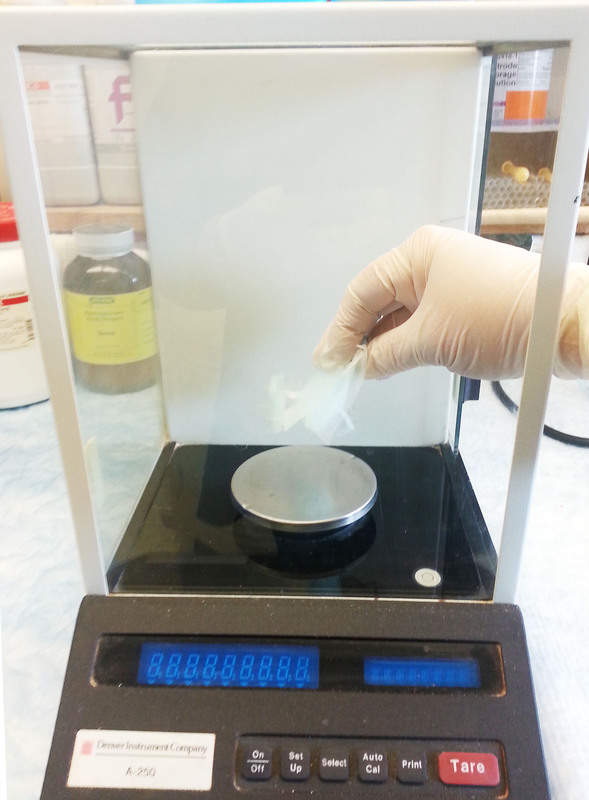 When we weigh nanoparticles, they are like a really fine dust. And this dust doesn’t really clean up very easily, at least with a brush. So, we’ve resorted to using small squares of Swiffer Dusters™ dusting cloths. And let me tell you, they work great! It works great for cleaning up standard lab chemicals as well – especially dyes like crystal violet which are notoriously difficult to clean off an analytical balance. I’ve weighed this dye out, thought I’d cleaned the balance thoroughly, only to find I hardly made a dent in cleaning it up. I can’t believe my lab didn’t discover these little gems earlier! 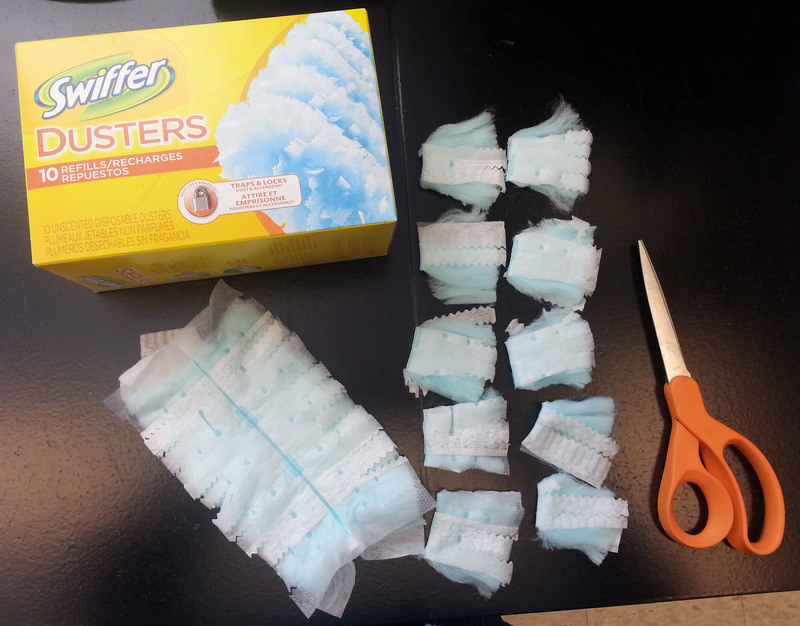 Swiffer Dusters™ dusting cloths, not just for house cleaning any more.